It doesn’t matter whether it’s the holiday season or throughout the year. Dust off your ice skates or rent a pair and have fun at these San Francisco Bay Area ice skating rinks. Create joyful memories with family and friends at The Holiday Ice Rink at Embarcadero Center in Justin Herman Plaza. 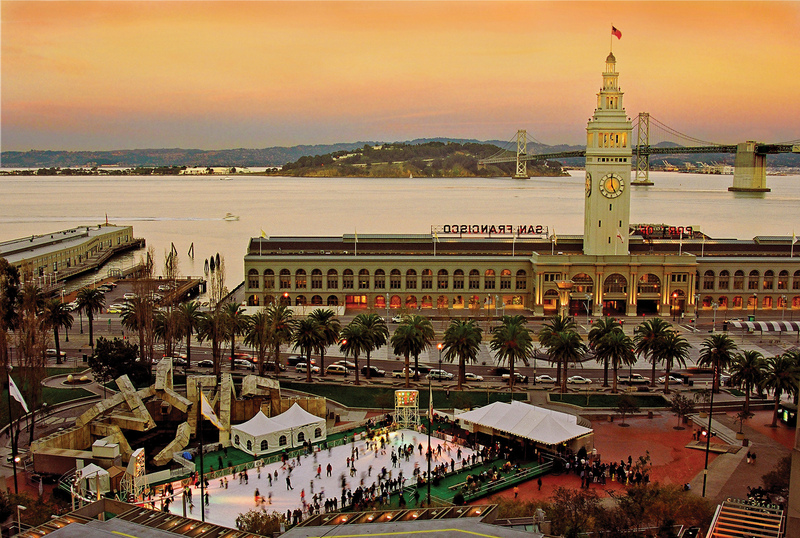 Presented by Hawaiian Airlines, the outdoor ice rink has been San Francisco’s annual holiday treat for over 25 years. The iconic holiday destination is the biggest outdoor skating rink in the Bay Area. 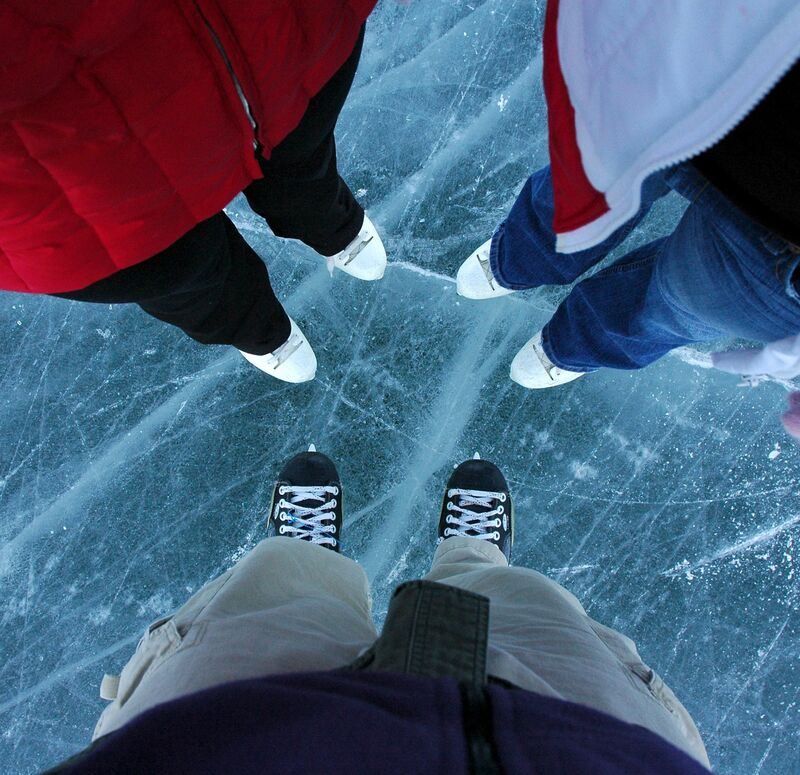 For 90 minutes, skaters can have a lively time gliding across the ice with a beautiful waterfront backdrop. Afterward, ice skaters can visit neighboring attractions San Francisco Ferry Building and Embarcadero Center for a delicious meal and shopping. Check out The Holiday Ice Rink at Embarcadero Center website or call for more details. 90-minute ice skating sessions begin every even hour. The Holiday Ice Rink maybe closed due to private party reservations or adverse weather conditions. Contact for schedule updates. Ice skate at Safeway Holiday Ice Rink in Union Square amid the holiday hustle and bustle. Safeway and Bank of the West collaborated to bring a seasonal ice skating experience to the landmark plaza. The venue ranks as one of the ‘Best Ice Skating Rinks in the U.S.‘ by Today. Alongside Macy’s Holiday Tree, the ice rink provides skaters 90-minute sessions beginning at the top of every even hour. Throughout the season, there are special events and performances to delight skaters of all ages. Single In The City: A Single’s Event, Drag Queens On Ice: Fa-la-la-la-abulous!, and Polar Bear Skate: The San Francisco Edition are the most popular events. Review the Safeway Holiday Ice Rink In Union Square website for more information. If you consider ice skating a year-round activity, Yerba Buena Ice Skating & Bowling Center has you covered. It’s the only year-round skating rink in San Francisco. Anyone interested in learning how to ice skate can sign up for classes at the ice rink. Lessons on figure staking and ice hockey are available to the community. Public skating sessions are held daily. Weekly theme events — Wednesday Night Cheap Skate, Saturday Night Dance, and Thursday Morning Coffee Club — provide discounts and incentives to visitors. To welcome the holiday season, an annual holiday ice show is performed with the help of local and elite figure skaters. East Bay ice skaters flock to Oakland Ice Center for year-round ice skating fun. Visitors can ice skate on either a 200-by-85-foot NHL-sized ice surface or a 200-by-100-foot Olympic-sized ice surface. The ice rink offers a plethora of ice skating activities — public skating, hockey, broomball, and ice dancing. Tuesday & Thursday Coffee Club, Tuesday Night Cheap Skate, and Sunday Family Fun promotions make the ice skating rink even more affordable for the public. Oakland Ice Center doesn’t forget about the holiday season. Each year, the venue produces a skating exhibition called Holiday Lights By The Bay. The 90-minute show features participants from the Oakland School for the Arts figure skating team. 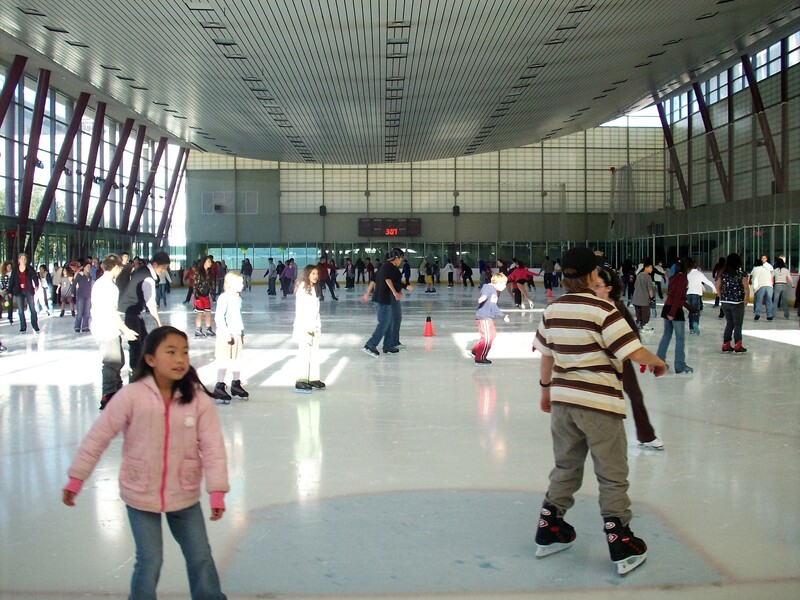 The Oakland Ice Center’s Learn to Skate, Special Skaters, and the Adult Synchronized skating teams participate in the showcase. Have you ever wanted to ice skate at an NHL team practice facility? Sharks Ice makes this dream a reality for excited Bay Area hockey fans. 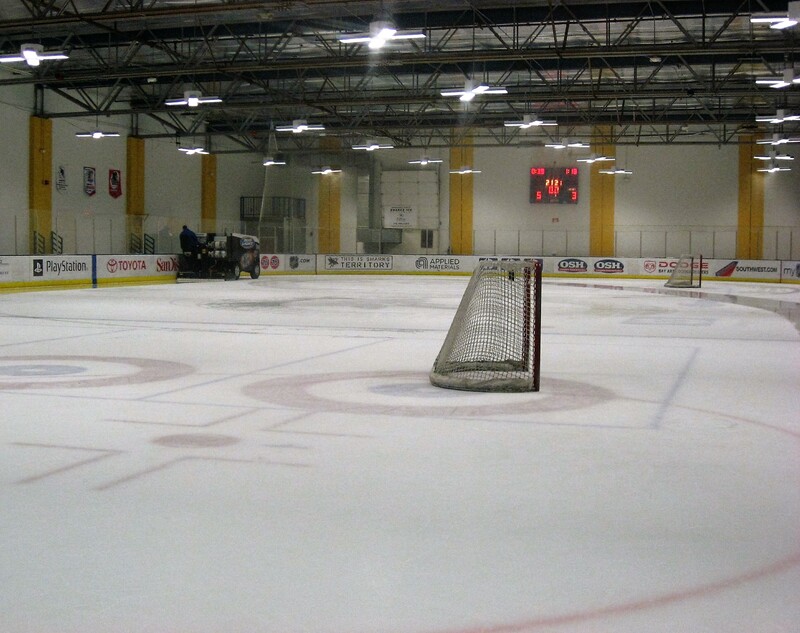 The San Jose year-round ice rink serves as practice facility for the San Jose Sharks. Each day, guests use hockey and Olympic-sized ice rinks for their ice skating needs. Opportunities to learn how to skate and play hockey are readily available. There’s even a weekly Monday Night Special promotion to encourage people to come out and ice skate. 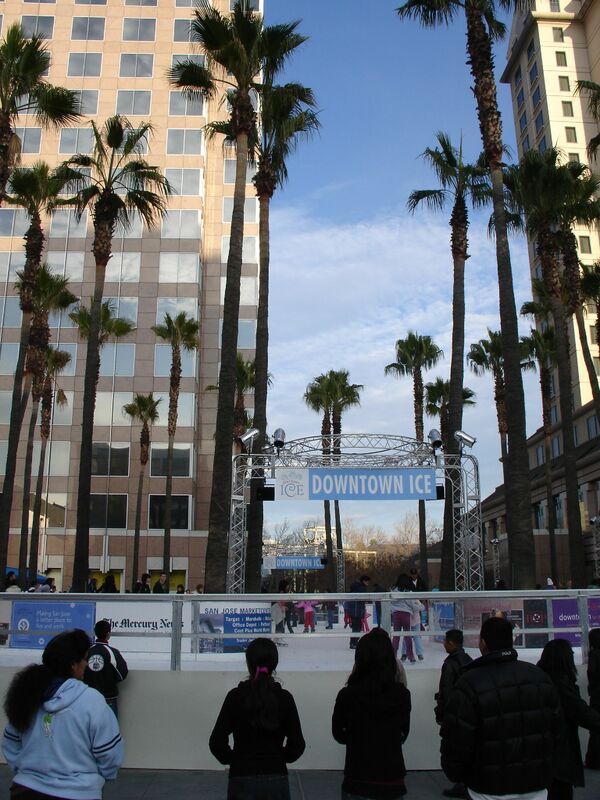 Want to get in the holiday spirit” Spend time at Downtown Ice in San Jose. Located at Circle of Palms Plaza, it’s the ideal downtown location for seasonal outdoor ice skating. At 8,100 square feet, the specially designed ice rink wraps perfectly around 32 palm trees making up the plaza. All the palm trees are decorated with colorful lighting, radiating in the night sky. Promotional days — BYOS Mondays, Retro Wednesdays, #TBT (Throwback Thursdays) Family Nights, and Aloha Fridays — add unique twists for visitors. Experience a winter wonderland nine months out of the year at Winter Lodge in Palo Alto. Since 1956, the indoor and outdoor ice rink has been a South Bay tradition. Guests enjoy an ice-skating-in-the-mountains experience without having to visit any mountains or colder climates. The cozy mountain clubhouse is equipped with warm fireplaces, rustic décor, and benches. During the holiday season, a Christmas tree is placed in the middle of the ice skating rink with glimmering lights, while the rest of the facility is decorated with ornaments and wreaths. Ice skating sessions are two hours. Lessons are available for the curious.